In most parts of the world, globalization has become an unstoppable and potent force that impacts everday life and international relations. 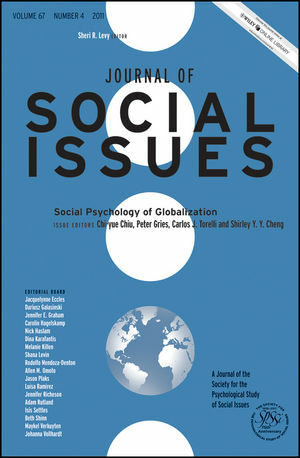 These articles in this book address the questions of how people make sense of and respond to globalization and its sociocultural ramifications; how people defend the integrity of their heritage cultural identities against the "culturally erosive" effects of globalization, and how individuals harness creative insights from their interactions with global cultures. The new theoretical insights and revealing empirical analyses presented in this issue set the stage for an emergent interdisciplinary inquirty into the psychology of globalization. Chi-Yue Chiu received his PhD from Columbia University and is the Executive Director of the Culture Science Institute and the Research Director of the National Institute on Asian Consumer Insight at Nanyang Technological University in Singapore. Peter Hays Gries is the Harold J & Ruth Newman Chair in US-China Issues and Director of the Institute for US-China Issues at the University of Oklahoma. He is author of China's New Nationalism: Pride, Politics, and Diplomacy (University of California Press, 2004), co-editor (with Stanley Rosen) of State and Society in 21st Century China: Crisis, Contention, and Legitimation (Routledge 2004), and has written over 20 journal articles and book chapters. Carols J Torelli is Assistant Professor of Marketing at the Carlson School of Management, University of Minnesota. He has a PhD in Business Administration from the University of Illinois at Urbana-Champaign. His research focuses on cross-cultural consumer behavior, glboal branding, motivated information-processing, and persuasion. Shirley YY Cheng received her PhD in social psychology from UIUC, and is an Assistant Professor of Marketing at the Hong Kong Baptist University. Her research focuses on the social psychology of globalization, specifically on how consumers react to the cultural implications of foreign brands. She is also interested in self-processes in consumer-brand interactions.